We are going to assume you are using a solar or wind or hydro electric system, or some combination of these. The VAST majority of such systems run all the electrical appliances at the same 120 volts AC that the typical home runs on. This discussion will be running almost everything on the native 12 volts DC that these power systems produce. Converting 12 volts DC that you are producing into 120 volts AC is very inefficient, especially when you realize how many devices just turn around and convert it back to 12 volts DC, or close to 12 volts. Also, by design, appliances built originally for 12 volts DC are much more energy efficient. If you plan on using your existing wiring for a 12 volt DC system, FIRST have any existing electrical utility company remove your pole meter and disconnect your mains. Next use a volt meter, or have an electrician verify that your distribution panel is dead. ONLY THEN disconnect the three mains wires. Your building wiring is then safe to work on. If using your existing building wiring, you should consider replacing your existing breakers with ones rated for low voltage DC use. Check with an electrical supply store for ones that can be simply swapped out with your existing AC breakers. 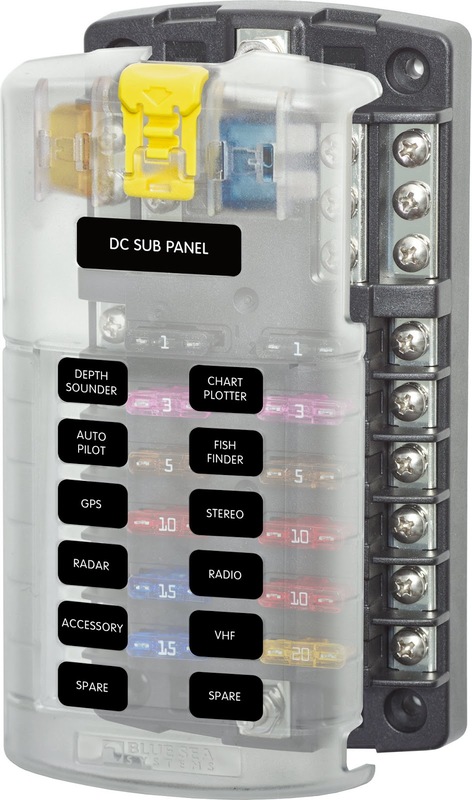 Otherwise, use a marine/RV style fuse panel and fuses, such as: www.amazon.com/gp/product/B001P6FTHC and standard automotive style blade fuses. Use as many circuit runs as you can to minimize the current on any single run. Fuse each run at 10 to 15 amps max, 5 is better. We are not zoning officers, nor do we play one on TV. It is up to you to make sure what you are doing is legal, or you are willing to take the possible consequences. This includes the resale of your home. Zoning and wiring rules will vary from location to location, and will vary depending on if you are rural or inside a zoned jurisdiction. Building permits may be required. The National Electrical Code's low voltage codes are the bare minimum guide. Some locations require a licensed electrician to install even a low voltage system. Take a look at appliances that may have non-electrical alternatives. Propane refrigeration, propane stoves, wringer washers, treadle sewing machines, clothes lines etc. There are many alternatives to electrical appliances, but make sure the chosen alternative does not have hidden electrical needs. For example, some propane stoves need electrical power for the ignitors so make sure the range and oven can be light by a match (always on pilots waste a LOT of gas, try and turn those off if possible, check the manual). Any appliance that produces heat (heaters, blow driers, coffee makers) are ALWAYS inefficient and alternatives should be sought; electrically produced heat is the most expensive type of heat. This military adage stresses the need for backups. Make a list of your electrical priorities, which items need to take power priority and should have backups, and which can you do without if need be. Security lighting and cell phones should probably get priority, if running low on power, shut other things off first. Have some kerosene lanterns as backup. A generator and battery charger are a good idea. Or a bicycle charger. We want to minimize the math, its really not rocket science running a 12 volt system. WATT - A WATT is a unit of power, if no work is being done that would use power, there is no wattage being used. Current - Measured in AMPS, current describes how much electricity is flowing in VOLUME. Voltage - Measured in VOLTS, this is the pressure of the electricity. Think of a water tank with a valve at the bottom which leads out to a water wheel grinding wheat. The higher the water tank, the more gravity pulls the water down and the higher the water pressure. The more you open the valve, the more water comes out to turn the wheel and do the work of grinding the wheat. If the tank is not very tall, you will have less PRESSURE and will need to open the valve more to get more water CURRENT to do the same amount of work done. If the tank is high, then close the valve for less CURRENT. The work WATTAGE stays the same as you regulate the current and pressure. In our discussion, the voltage will stay at 12 volts, so we need only be concerned with the AMPS. Battery bank - Your battery bank has a capacity measured in Amp-Hours. This measures how many AMPS it can put out in a given number of hours. Our battery bank has a capacity of 900 amp hours, so it can put out 1 amp for 900 hours, or 900 amps for 1 hour. This is a simplistic statement, and the batteries are usually stated at a 20 hour rating; take it out faster and the rating drops, and slower it rises; 900 amps would take far less than an hour to exhaust the battery, and 1 amp would last far longer than 900 hours. Power stored in the battery bank is used to run your appliances when there is not enough power coming out of your power production system. Batteries waste about 20% of the produced power in the process of storing and retrieving the produced power. Your battery bank needs to be built from the correct type of batteries. NOT car batteries, and NOT marine deep cycle batteries. The most cost effective batteries that don't need a forklift to move are 6 volt golf cart batteries. Energizer GC2 batteries from Sam's Club (www.samsclub.com/sams/energizer-golf-cart-battery-group-size-gc2/prod6750008.ip), two connected in series to equal 12 volts, are a great choice. Put the pairs in parallel for more capacity, we have 8 batteries in 4 pairs for our bank). NOTE: Make sure you have a good vent to vent the explosive hydrogen fumes outside. We use a storage box with a powered fan to exhaust the fumes outside. 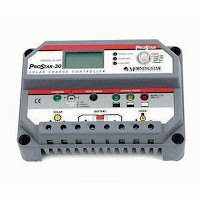 Charge Controller - The charge controller is responsible for making sure your batteries are not damaged by getting over or under filled. We recommend the Morningstar ProStar 30 Charge Controller (www.amazon.com/gp/product/B002MQWXB4). NOTE: If you are using wind or hydro, you need a different type of charge controller. Both wind and hydro turbines use the battery load to act as a brake; if the charge controller disconnects the batteries when they are filled, the turbine will tear itself apart with no load. 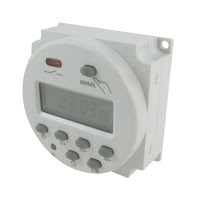 You will need a charge controller that can switch in a dummy load when the batteries are filled. Solar/Wind/Hydro - Your power production goes to power any running appliances and the excess goes into the battery bank (the charge controller keeps the battery bank from becoming overfilled). Your power production must be large enough (current) to both run your appliances and store excess in the battery bank to use when there is no sun/wind/water. Most of these systems are advertised in WATTS, so just divide by 12 (remember watts = volts X amps) to get a close idea on how many amps are produced. Most are also over-advertised, we have six 45 watt solar arrays, so we would expect (6 X 45) / 12 = 22.5 amps, but in reality the most we ever see is 13.2 amps. And then remember a total of about 20% will be lost by the process of going into then back out of the battery bank. We have been using the Harbor Freight 45 watt solar kits, but are evaluating the Grape Solar panels at this time (www.homedepot.com/p/Grape-Solar-250-Watt-Monocrystalline-Solar-Panel-GS-S-250-Fab5/203079647?N=25ecodZ25ecodZbu8l#.UXQA0LVg80o). Wiring - The thickness of the wires that the electricity goes through produces RESISTANCE; the thicker the wire (smaller gauge number), the easier for the electricity to go through. If the wires are too thin, then the resistance is high, and the voltage drops as the current increases. So, by using thicker wires, and by using multiple circuit runs, you can minimize the amount of current going through the wires. Use 12 gauge wires at a minimum (also required by the National Electrical Code), we used stranded two conductor landscaping wire (zip cords). The longer the wiring run, the worse the resistance effect, so use larger wires (10 or 8 gauge) for long runs or runs you know will need more current. Low voltage DC circuits (less than 50 volts by NEC standards) don't typically need grounding, so using two conductor wiring saves on cost. Of course, if you are using existing 120 volt AC wiring, you are already covered in gauge and even an optional ground. If you are using your existing wiring, you can use your existing AC outlets and light sockets and switches. NOTE: Replace any dimmer switches with regular on/off switches, the dimmers won't work; same for florescent lighting and timers, they won't work and need to be replaced. Polarized outlets - In a DC electrical system, you have a positive and a negative wire, it is critical that you use these correctly; plugging something in backwards will destroy it. So make sure all your outlets are polarized, meaning that one slot is larger than the other, and make sure all your plugs, extension cords etc. have plugs that likewise have one larger than the other, this way they can only be plugged in one way. We use the standard of positive being on the smaller slot. When wiring them in, use a volt meter (Harbor Freight, $5.00) to verify that the polarity is correct before plugging anything in. Light sockets should have the positive on the center 'button' and negative on the screw in sleeve. Cigarette outlets - If not using existing outlets, you can buy cigarette plug outlets to mount in the wall to plug in your appliances. Many 12 volt appliances come with cigarette plugs on them. If you have re-used your existing 120 volt AC outlets, make up some pigtail adapters that have a two prong polarized AC male plug on one end and a female cigarette plug adapter on the other. We found the most cost effective way of doing this is to buy three way automotive cigarette adapters, cut the male plug off giving you three female plugs each with a short zip cord, then attaching two prong AC male plugs from the home supply store onto those ends, giving you three pigtale adapters. Make sure that the positive ends up on the center 'button' of the cigarette plug and the negative on the sleeve, use your volt meter. Lighting - After more than 100 years, people have gotten used to understanding how bright a lightbulb is by its wattage. This is wrong, but common. The wattage of a bulb is a measurement of how much power it takes to do its job, not how bright it is. But due to this common usage of wattage for brightness, energy efficient bulbs express two wattages; the actual wattage they draw, and the equivalent wattage that compares their brightness to an old fashioned incandescent bulb. In 12 volts, you have 3 lighting choices; incandescent, florescent, and LED. Simply put, LED is ALWAYS the way to go. But even in LED, not all bulbs are created equal. First, go with bulbs that use standard E26 (or E27) bases so you can screw them into standard light sockets. Second, go with one of these two bulbs from lc-led.com; 75 watt equivalent (6 watt actual) (www.lc-led.com/View/itemNumber/623) or 50 watt equivalent (4 watt actual) (www.lc-led.com/View/itemNumber/575). These two bulbs pull far less current than ANY other LED bulbs we have looked at. Things with motors - There are two types of motors; those with brushes and brushless. Brushless motors pull far less current, so try and find those. An example are the O2-Cool Battery fans (available at Wal-Mart); an 8" fan pulls 0.5 amps compared to a small 3" automotive fan that pulls 1 amp. Plus the O2-Cool fans come with a 12 volt wall-wart, chop it off and replace with a standard plug and you are ready to go! (see wall warts below). Wall Warts - Lots of 120 volt AC appliances use those little plug in AC transformers, known as Wall Warts. Look at the label, many are 12 volt DC transformers! Just cut the wall wart off, then using your volt meter (in the OHMS or continuity mode) to determine which wire is the positive and which is the negative, put a 2 prong polarized male plug on the wire and you are ready to go. DC but not 12 volts - Sometimes you will have an appliance that is DC but not 12 volts. Laptops often run at 19 volts DC, small devices may need less than 12 volts. USB devices like cell phones can simply use automotive cigarette adapters to convert the 12 volts down to the USB 5 volts. For the other devices you will need a DC to DC converter (much more efficient than using an AC inverter). Wal-Mart sells a down-converter for devices needing less power (www.walmart.com/ip/PowerLine-2000-mAh-Car-Cord-Adapter/17134646). If higher voltages are needed, we suggest the PST-NBPSU150 from Powerstream (www.powerstream.com/ADC-p006.htm). Inverters - Okay, this goes against the whole point of this discussion, but bears addressing. Sometimes you will have a device that simply needs 120 volts AC to run. In these types of cases you have two options; a large inverter mounted at the battery case and using an extension cord, or small portable cigarette socket style inverters. We suggest going both routes. And using only when necessary! There are many places to find appliances for 12 volt living. RV stores and truck stops are some of the best. You can even find 12 volt microwave ovens (www.amazon.com/Power-Hunt-Portable-Powered-Microwave/dp/B00758HQS4). Search for '12 volt' on Amazon.com. Good job breaking it down but still out of my realm a little. Mainly when it comes to the actual hook up/ conversion of my existing panel and wiring to battery banks. I could build you a house from scratch but couldn't wire a light switch.